Sue Bailey, 85, Nevada, passed away Friday, Feb. 17, at the Barone Alzheimer's Care Center in Nevada, following a lengthy illness. She was born Aug. 21, 1926, in Cotter, Ark., to Jonathan Calloway Beavers and Bertha Lena Bullen Beavers. She was married Feb. 6, 1946, in Harrison, Ark., to John Bailey and he preceded her in death Nov. 30, 1999. Mrs. Bailey was born in Cotter, Ark., and grew up there. Following her marriage, she and her husband lived in a variety of locales as he was a railroader. She came to this area in 1961 and has resided here ever since. 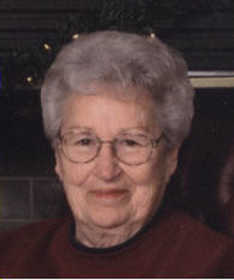 She was an avid volunteer at the Salvation Army Thrift Store as well as the Spirit and Truth in Nevada. She loved attending her grandchildren's activities. Survivors include two daughters, Suzanne Melton, Nevada, and Kathryn Keeney, Neosho, Mo. ; eight grandchildren, Donald Melton, Webb City, Mo., Christy Ast, Nevada, Jason Bailey, the state of Utah, Joshua Bailey, Bronaugh, Mo., Jacob Bailey, Warrensburg, Mo., Cameron Crawford, Neosho, Mo., Caitlyn Crawford, Joplin, Mo., and Collin Crawford, Webb City, Mo. ; 11 great-grandchildren; and one sister, Peggy Tetro, Phoenix, Ariz.
Funeral services will be held at 10:30 a.m., Monday, Feb. 20, at Ferry Funeral Home in Nevada, with Larry Brown officiating. Interment will follow at Newton Burial Park in Nevada. Friends may call now and until the hour of service at Ferry Funeral Home in Nevada. Contributions may be made in her memory to the Vernon County Cancer Relief Fund in care of Ferry Funeral Home, 301 S. Washington, Nevada.